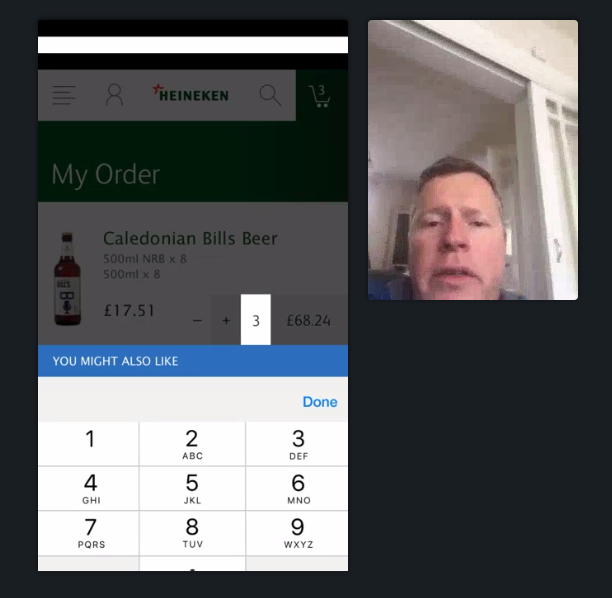 Heineken approached us to help them create a responsive mobile version of their trade ecommerce website, led by the output from the product consultancy sessions we'd run with them previously. It was critical to Heineken that they develop an industry-leading solution, but also gain real experience in modern product development approaches and processes. Specifically how Agile, user-centered design and lean methodologies could work in a large organisation like Heineken. To further reduce typical design process overhead, we adopted a rapid design-prototype approach. Using a combination of Sketch and InVision to integrate visual designs immediately into a prototype, and then using the prototype as the primary way to demo and discuss visual and interactive design. This approach helped us cover two bases in one, promoting clear communications on design and interactive ambitions to non-technical and technical members. With the teams working on the project split between three locations across the UK, we created a process that promoted regular team communication, open sharing and clear definition and responsibilities. Using Trello and Slack as our lead project tools, we implemented a process modelled around two-week sprints. With prioritised, estimated user stories, bi-weekly reviews, planning, retrospectives, and weekly-standups. User research was performed toward the end of each sprint. Interviewing Heineken customers directly, gorilla testing with Heineken staff, and with anonymous unmoderated users. We used a combination of tools and solutions to perform user research. As most users weren't nearby, we had to adopt a flexible, remote testing solution. A combination of phone screensharing, usertesting.com and lookback.io formed much of our approach. After completing the project, we wanted to have a quick look back at some stats on aspects of the new processes we brought to the project. Our proudest statistic is we performed over 15 hours of user research, that's a ratio of 1 hour of research per week of design. A great example of the iterative and flexible process Heineken quickly engaged in. Follow the latest insights, jobs and new products from our studio in Chiswick. Thank you for you registering. We promise to only occassionally send you tasty news and treats.